President Donald Trump disparaged the media, Democrats, Americans who want Confederate monuments taken down, “weak leaders,” his White House predecessor and a long list of other opponents at a rally in Phoenix tonight. Trump always found large, energetic audiences when he campaigned in Arizona, and his supporters inside the Phoenix Convention Center tonight were no different. Outside, protesters spoke out against Trump’s policies and a potential pardon of former Maricopa County Sheriff Joe Arpaio, which the president hinted is coming. Phoenix Police used tear gas to disperse protesters after the rally ended. Much of the speculation about today’s rally centered on a pardon for Arpaio, who was convicted of contempt of court for defying a court order related to his anti-immigrant policies. 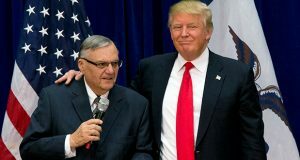 Trump didn’t pardon Arpaio tonight, but hinted a pardon is coming soon. “Do the people in this room like Sheriff Joe?” Trump asked the crowd, who responded with sustained cheering. Trump said Arpaio was convicted for doing his job, and he should have been tried by a jury, something Arpaio’s lawyers also argued for. But Trump said he didn’t want to pardon Arpaio tonight because he didn’t want to cause any controversy. Trump repeatedly said the country was “just one vote away” from repealing and replacing the Affordable Care Act, a clear swipe at Sen. John McCain, who was the deciding vote against a “skinny repeal” plan a few weeks ago and whose opposition halted the repeal-and-replace effort for now. Trump urged Arizonans to “speak to your senator,” meaning McCain, about health care. Trump also said he would repeal Obamacare even if he has to shut down the federal government. He didn’t say Sen. Jeff Flake’s name either, but noted that Arizona’s other senator was “weak on borders,” eliciting boos from the crowd. Despite his digs at Flake, Trump didn’t endorse or even mention anyone who is or could run against the incumbent in a Republican primary. Some had speculated that a Trump tweet from last week praising Kelli Ward, the former state senator who is running against Flake, could mean a presidential endorsement today. People entering the Phoenix Convention Center said they weren’t allowed to bring in Ward signs or wear Ward shirts, though some people standing in line had Ward campaign paraphernalia. One man recounted how he had to borrow a shirt from a random person in line after he wasn’t allowed in because he wore a Ward t-shirt. Former Arizona GOP chairman Robert Graham and Arizona Treasurer Jeff DeWit have been floated as potential Flake opponents who Trump could back, but they, too, remained unmentioned tonight. Gov. Doug Ducey met Trump and Vice President Mike Pence on the tarmac at Phoenix Sky Harbor Airport this afternoon, but he did not attend the rally. Instead, Ducey spent the evening at the Emergency Operations Center, where state law enforcers worked to keep the downtown area safe for the large, tense event. Arizona’s business and political leaders have for months emphasized how the North American Free Trade Agreement positively affects the state’s economy. But their efforts may not have worked, at least with the president. Trump told the crowd he had promised them from the beginning that NAFTA would be renegotiated or terminated. “I personally don’t think you can make a deal without terminating it, but we’ll see. You’re in good hands,” he said. As was the case during Trump’s campaign rallies, DeWit, who was also the chief operating officer of Trump’s campaign, kicked off tonight’s rally. DeWit highlighted the stock market’s rise and new jobs added, and said Obamacare will hopefully be done for soon if Congress gets its act together. “We elected our president to go and drain the swamp, and drain the swamp he’s doing,” DeWit said. Trump also acknowledged and thanked Republican Reps. Andy Biggs, Trent Franks and Paul Gosar, who attended the rally tonight. Democratic Rep. Raul Grijalva, meanwhile, led a peaceful anti-Trump protest in Phoenix before the rally began. Once Trump took the stage, he praised Arizonans, saying they were “hardworking, American patriots,” and said the state has been on his side since he held his first rally here. “You were there from the start, you’ve been there ever since, and I will never forget. Believe me, Arizona, I will never forget,” Trump said.